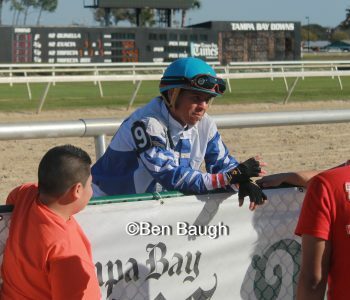 Pablo Morales chats with fans at Tampa Bay Downs (photo by Ben Baugh). The footprint in the shedrow of a young boy literally following in the footsteps of his father provides insight into the life of someone who would pursue and realize his dreams. Those footsteps are leaving an indelible imprint in the world of thoroughbred racing — and they belong to Pablo Morales. The son and grandson of a trainer, Morales was almost literally born into the sport. In a small house at the end of many of the barns in Limu, Peru, where Morales grew up, generations of horsemen would immerse themselves in the sport. It was a lifestyle that had its benefits, providing Morales with access to horses and experienced horsemen — his family — who willingly would share their insights and knowledge. Those early lessons would prove invaluable. A trip to Florida at 11 years of age to visit his sister, who lived in Miami, was a defining moment. 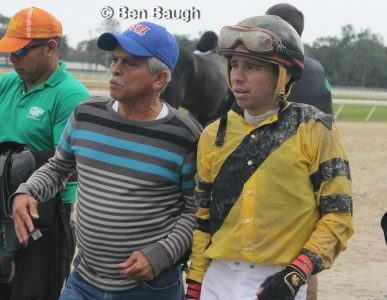 Having grown up on the backside, the racetrack and its environment was something that was familiar to Morales, but a trip to Gulfstream Park would forever alter his life. “I took pictures with all the big jockeys — Edgar Prado, Jorge Chavez, Rene Douglas, Jerry Bailey and Pat Day, and that’s when I said, ‘I want to be a jockey, and I want to be a jockey in the United States,’” said Morales. When he returned to Peru, he would begin his sojourn toward becoming a professional athlete. A helmet, vest and custom made boots all became part of his routine attire and, by the time he was 12 years old, he had begun galloping horses at the racetrack. Despite his equestrian background, Morales said the decision to become a jockey was his and his alone. Morales’ parents were supportive, but his passion for the sport was self-driven and it was at his request that he start being put on horses. He would eventually attend jockey school in Lima. However, the start of his career as a jockey was far from glamorous. The 15-year-old apprentice made the long ride to a little known racetrack, Arequipa, with no money and a great deal of anxiety. That initial success, which saw him win three races and finish in the money (third or better) on all seven of his mounts, served as the impetus he needed. He put his riding career on hold temporarily, to honor his mother’s request to finish out the school year, as he was only 15. “I missed about a month of school,” said Morales. 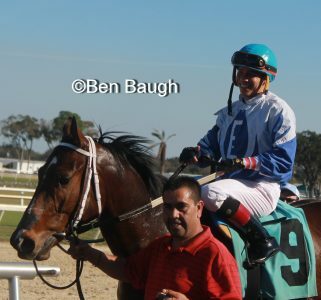 Pablo Morales rides another winner (photo by Ben Baugh). The completion of the school year would allow him to take the leap of faith, one that would provide him with the opportunity to pursue his dreams. He would get his papers and start toward his objective and, once again with the support of his family, take the next step of turning his vision into reality. Alena’s Boy would provide Morales with his first victory in the U.S. However, mounts were difficult to come by, and the dearth of opportunities left the young rider with a lot of questions. Morales also had the challenge of not being able to speak English and no money, but he persevered despite the adversity. Corey Moran was Morales’s first agent when he began riding in the United States, but one’s fortunes in thoroughbred racing can change quickly. However, while he was recovering, Morales was contacted by agent and former jockey Richard DePass. Morales made the decision to shift his tack, but not being licensed in New York at the time, he had to get his mother to sign the papers so he could relocate to the Empire State. Morales had flown to New York, a month prior to his return to riding, arriving in Saratoga, and staying with fellow Peruvian and journeyman jockey Cornelio Velasquez, who was a steadying influence on the young rider. It was that support early in his career, from practical strangers, that would make a difference. Several of the jockeys knew him from the time he was little because of his family’s connections. It proved invaluable in Miami and later in New York. The teenager found himself in an adult world, which was overwhelming at times. It was a surreal experience for Morales, but he was actually living and experiencing what he had thought and dreamt about. The opportunity to ride in New York as a teenager left an indelible imprint, but Morales wishes he would’ve been a little older. “I think it would’ve been better for me,” said Morales. “It was so early in my career. I was extremely mentally young. I went from living with my parents to riding with the best of the best. I wish I would have been a little more prepared and mature. I think my career would’ve taken off a little faster with the opportunities that I had. I’m just happy with what I’ve accomplished. Looking back now, I realize that I was a baby. But as time went on, Morales became more comfortable in his new environment, adapting quickly and learning English in a somewhat unconventional way. The fact that he was so young seemed to be advantageous as he acclimated at a rapid rate. He was able to understand what people were saying to him, and make himself understood as well. Pablo Morales (photo by Ben Baugh). A propitious set of circumstances found Morales in the right place at the right time. He had only been riding in New York for about a month, when he would get an opportunity to ride in an out-of-town stakes race. “I broke in really fast, started winning a couple of races, I got lucky picking up a horse that hadn’t been my mount, and convinced the trainer to put me on the horse for the Super Derby,” said Morales. It gave Morales his biggest win to date. The horse was The Daddy, who won the $750,000 Grade II Super Derby at Louisiana Downs by a head. However, prior to the race, there was so much going through the young jockey’s mind, a world of opportunity and experiences that would be overwhelming to most teenagers. But sometimes, it can be advantageous to be less experienced, when going into a situation with a number of unknown variables. Morales had a plan going into the race, and rode The Daddy in the Super Derby, exactly the way he had imagined prior to the race. The victory on The Daddy provided Morales with some financial stability. He was able to pay his sister back, who helped pay for his work papers and the lawyer, who made the dream of riding in the United States possible. The money also allowed him to bring his older brothers to New York, making the transition to the states a bit easier. At the time, even though he was enjoying success as a professional athlete, he still hadn’t obtained his driver’s license. A man of great humility, Morales acknowledges the support he’s received from people over the years, and how they’ve helped him achieve success and realize his dreams. However, his win on The Daddy wasn’t his only major victory of 2005, the jockey also won the Fall Highweight Handicap on Thanksgiving Day, making the celebration more meaningful than just sitting down with the family for turkey and cranberry sauce. A Hall-of-Fame jockey was supposed ride Atilla’s Storm, but fortuitous circumstances would preclude him from getting to the track, allowing Morales to pick up the mount on the Rich Schosberg charge. Morales, like many other journeymen riders, has plied his trade nationwide, but, for years now, he’s ridden regularly on two circuits, going out of town for the occasional stakes race. He’s a four-time leading rider at Presque Isle Downs in Erie, Pennsylvania, and is consistently among the leading riders at Tampa Bay Downs in Oldsmar, Florida. Family has always been important to Morales. His wife is the daughter of thoroughbred trainer Eduardo Rojas and his daughter Sofia, who’s seven, and son Camilo, who’s five, play a large role in his life, helping him stay focused. Morales’ family’s support has been critical to his success. When he’s not at the racetrack, he can usually be found spending time with his family, going to the beach, mall or park. Erie, like Oldsmar, has been very welcoming to Morales and his family. His evolution as a rider and development as an athlete and person has allowed him to sustain and achieve in a very competitive business. His mental approach, discipline and focus have drawn the attention of trainers, instilling a sense of confidence and trust, making Morales a much-sought-after rider. It’s that positive approach, sense of calmness and confident demeanor that has enabled Morales to develop a robust network of connections. One of the trainers that saw his potential was Blazing Meadows Farm’s Tim Hamm. However, when agent Paula Bacon decided to take Morales’ book, she was impressed with the jockey for several reasons. His strong work ethic, dedication to his family and commitment to the sport were among those attributes that brought the two together. Like Hamm, she loved the way he finishes races, too. But his character and his respect for others make him a rare commodity in an ever-changing world. There have been a number of stakes winners since The Daddy and Attila’s Storm, Morales’s first two added-money victories in 2005. The rider, who’s approaching 1,600 lifetime victories, has won stakes on Zippy Shannon, Great Intentions, Cash’s Girl, Akronism, Fleet Valid, Rustler Hustler, Big Wednesday, Angelofdistinction, Lotta Lovin, Leinan, Dundalk Dust, Hasay (GB), Lucky Lewis, Happy to Go, Needmore Flattery, R Frosty One, Velvet Mood, Stardoza, Oldzfourfortytwo, Candy Exchange, Tiger Blood and, most recently, Hijo de Sheltowee and Almond Roca. Those wins have taken on added significance for Morales, recognizing the work that’s gone in to getting to this stage of his career, and the team of people it takes to get a horse to the winner’s circle. Morales was the leading rider at Presque Isle Downs in 2011-2013, sharing the title with Huber Villa-Gomez in 2011, and again in 2017. When Morales isn’t at the racetrack or with his family, on his days off, he’s found a way to keep himself in shape for the rigors of the sport, one that lasts all year. He places great gravitas on maintaining his fitness level. He found something that improved his agility, arm strength and reflexes. It was about a year and a half ago, Morales, who doesn’t like to run, found another sport to make part of his conditioning routine. The stability that comes with having a family has helped in Morales’s evolution as a rider, he understands the risks that are associated with the sport, and has been very conservative with his money. The jockey, who won at a 21 percent clip in 2017, finishing with 201 victories, knows about adversity. A spill one morning in 2010 left him with five broken vertebrae. A typical day for Morales finds him waking up, taking a shower, making coffee and immediately going to the track. Some days are busier than others, with the amount of horses he gets on, meeting with people, saying hello to everyone, and then going home before the races. He’ll shower, eat something light, and then, after a brief period of time, he’ll return to the track at about 11 a.m., with post time at Tampa Bay Downs being about 12:20 p.m.
“When I get to the [jocks] room, the first thing I do is check my weight, and then I go into the hot box for about an hour,” said Morales. “When I get out, I grab my program and I just start studying. I start writing down what horses have speed, what horses come from behind, what horses and riders I should be on the lookout for. As his agent Paul Bacon said, “He’s one of a kind.” Morales is a study in humility and authenticity. A rare breed of athlete, Morales’s character is evocative of another era, resonating powerfully with all that he touches.